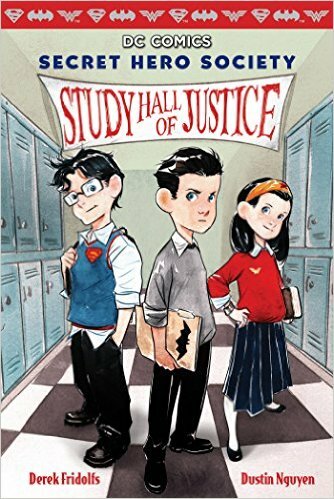 This is a really cute and charming imagining of Superman, Batman, and Wonder Woman as kids who enroll in a really weird school. 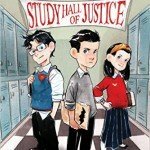 Told through journal entries, IM conversations, lists, diagrams, and straightforward graphic novel panels, the book introduces us to this version of Clark, Bruce, and Diana, and traces their investigation into the school and its mysterious principal. The concept is fun, and the structure of the book is really clever. The decision to use things like journal entries, IM conversations, and diagrams to tell the story gives the reader multiple perspectives on the narrative, and keeps the storytelling fresh. It also lets the reader experience some of the unsettled-ness that the trio feel as they investigate, as every page has something unexpected. Those with a passing knowledge of the DC universe can absolutely enjoy the story–it’s a great entry for kids who aren’t into comics–but there are all sorts of delights if you are a fan, especially in seeing which DC characters hold which school roles. The characterization of the Trinity is dead on: Bruce is typically intense and really likes bats, okay; Clark is unfailingly positive and terrible at hiding his Kryptonian origins (“I can’t see through walls or anything. Just a guess”); and Diana is so dedicated to truth and justice that she keeps losing her temper whenever the students and teachers at the school demonstrate opposite values. It’s tough to find superhero books that are appropriate for kids, and I’m excited that this book is genuinely smart and fun. Dustin Nguyen is my favorite comic book artist, so I’m especially happy that he’s been involved in so many all ages books (Batman Lil Gotham #1 is a joy). This is a little too young for 7th and 8th graders, but 3rd-6th graders would love it. My 6th graders are always asking for comic books and graphic novels–the girls and the boys–and I’m happy to add this book to my library next year. - Kids can quiz on it!